Some of the reasons behind Microsoft canning its dual-screen Courier tablet have leaked out and it seems that Bill Gates played a big part in the concept kit not becoming a reality. Back in 2010, Gates did admit that a number of tablets were being proposed at the time the Courier surfaced and this rings true with information Cnet had procured, which reveals that two separate groups in Microsoft were vying to bring tablets to market. When Gates heard about the Courier tablet from Ballmer, he felt it was a piece of kit that wouldn't sit well within Microsoft's software-led ecosystem. This was because it was being made with creatives in mind and wouldn't plug into business services like Outlook that earn Microsoft a lot of money. Because of this, and according to those working on the Courier, "Bill had an allergic reaction" to the device plans. 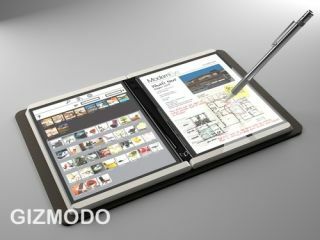 As well as J Allard, who was pushing the Courier, Steven Sinofsky was also creating a tablet concept that would use a tablet-friendly version of Windows. But the problem with this was that it was a good two years away from fruition. So, instead of Ballmer releasing the Courier which was not aligned with Microsoft's existing franchises, the tablet was pulled and the hole in the market wasn't plugged.